Our buses have electric doors with different opening options; inwards, outwards, or sliding, and are equipped with automatic security sensors and internal emergency devices. These doors are combined with access ramps for persons with reduced mobility (PMR), which can be manually or automatically operated. The integral low floor and arrangement of the seats inside the vehicle ensure that passengers can enter and exit smoothly at stations and move around freely inside the vehicle. 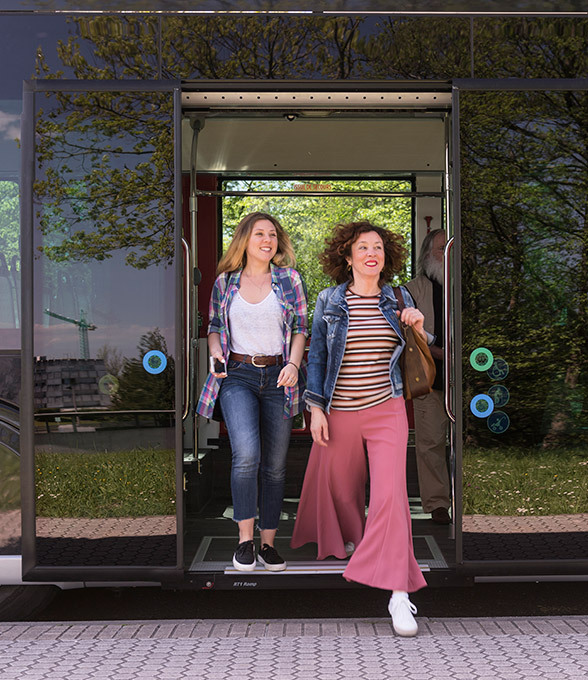 The 18-metre vehicles have a capacity for up to 155 people with 8 sliding doors, making them unique among electric buses. They may accommodate up to four areas for wheelchairs and/or child strollers. We offer the possibility for stop request buttons in Braille, signage on seats reserved for wheelchairs (size and colour of seats), audible stop request information, and endless other options such as installation of ticket validation devices, all designed for improved accessibility. We exceed the R107 approval as regards the section on accessibility of persons with reduced mobility by offering manual or electric ramps for disabled persons. For the blind, we have designed a system of stops to indicate the location of seats. We offer a high degree of flexibility for the design and distribution of seating as well as the location of wheelchairs.